Apostasy is an important yet often neglected subject when attempting to comprehend what the Bible teaches about the end times. Thus, this series of articles is dedicated toward tracing ten general, biblical characteristics of apostasy. In the previous articles, apostasy was defined as a movement within Christ's church representing a departure from known truth. It was also established that apostasy is the central sign revealed in Scripture signaling the near completion of the church's earthly mission, that warnings against apostasy consume much of the New Testament, and that these New Testament warnings relate to virtually all of Christianity's most cherished doctrines. Apostasy is also a phenomenon that occurs internally within the church, is led by individuals considered the least likely candidates to depart from truth, can happen quickly, and is ultimately satanically energized. This article will attempt to develop two more characteristics of apostasy: its destructive character and the deleterious impact it has upon those within the church who are attempting to remain faithful to God's truth. Apostasy takes a toll. Bleeding sheep, bruised feelings, and disillusioned Christians are always found in the wake of any church or group that apostatizes from the truth. The Spirit wants believers to be aware of the dangers associated with apostasy, which explains why Scripture frequently analogizes apostasy to familiar dangers from the physical world. For example, 1 Tim. 1:19-20 compares apostasy to a shipwreck when it says, "…which some have rejected, concerning the faith have suffered shipwreck, of whom are Hymenaeus and Alexander, whom I delivered to Satan that they may learn not to blaspheme" (italics added). 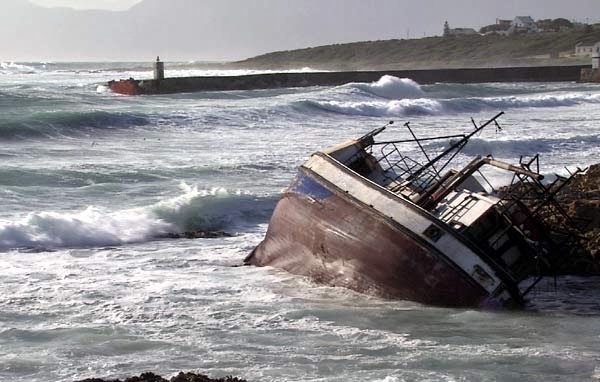 When we contemplate a shipwreck we think of the tremendous loss of life and property. Yet, just as a shipwreck is harmful in the physical world, apostasy is equally as harmful in the spiritual realm. On a similar note, Paul also compared apostasy to ravenous wolves entering the flock and gorging upon innocent sheep. Acts 20:29 says, "I know that after my departure savage wolves will come in among you, not sparing the flock" (italics added). Paul later warns, "And their message will spread like cancer. Hymenaeus and Philetus are of this sort, who have strayed concerning the truth, saying that the resurrection is already past; and they have overthrown the faith of some" (2 Tim. 2:17-18, italics added). Here, Paul analogizes apostasy to "cancer" (NKJV) or "gangrene" (NASB). We are all familiar with the destruction that "cancer" or "gangrene" can bring upon the physical body. Through the use of this metaphor Paul notes that apostasy is equally as damaging to one's spiritual health. Thus, in verse 18, Paul explains that the apostasy introduced by Hymenaeus and Philetus had overthrown or unsettled the faith of some. Here, the verb translated "overthrown" is also used in John 2:15 in reference to how Christ overturned the moneychangers' tables in the temple. Like the overturning of a table, apostasy represents a similar destabilizing influence. We are quick to recognize danger in the physical world. We remember the Tylenol scare of the 1980's. At that time, it was discovered that some people who had taken cyanide-laced Tylenol had died. Once this was discovered, public service announcements were given, Tylenol was recalled and banned, and new protective legislation was passed all in an attempt to keep others out of harm's way. In other words, society reacted appropriately and promptly to the prospect of physical danger. While we are quick to recognize a physical threat, we are not as equally aware or vigilant in the presence of spiritual threats. Yet, Scripture, by analogizing apostasy to familiar dangers from the natural world, is explaining that apostasy is just as destructive to one's spiritual life. Another reality associated with apostasy is the difficulty it brings upon those within Christ's church desiring to remain loyal to biblical truth. Paul said, "But evil men and imposters will grow worse and worse, deceiving and being deceived" (2 Tim. 3:13, italics added). He also predicted, "For the time will come when they will not endure sound doctrine, but according to their own desires, because they have itching ears, they will heap up for themselves teachers, and they will turn their ears away from the truth, and be turned aside to fables" (2 Tim. 4:3-4). Although there are many applications of these verses, they bear a striking similarity to a modern ministry philosophy that has captured the hearts of many of today's evangelical churches known as the "church growth movement." Church growth is not per se wrong as long as God is the one giving the growth (Matt. 16:18; Acts 2:47; 1 Cor. 3:6). However, God-induced numerical growth is not what modern-day church growth advocates promote. Rather, what they mean by church growth is sociological polling in an attempt to determine what the unsaved want to experience in church. When such data is collected, it is concluded that the unsaved want entertainment, shorter sermons, "practical" preaching enabling them to succeed in business, and fewer references to offensive concepts such as blood, hell, sin, or Christ's second coming. The church growth movement then concludes that if the church is then repackaged to satisfy these yearnings of the unsaved, then people will flock to church thereby causing it to grow. While no one disputes that large crowds can be accumulated through the use of this methodology, the real question is, "does the end result represent God's definition of what the church is supposed to be?" In actuality, what transpires is that the spirit of the world invades the church. Consequently, 2 Tim 3:2-4 represents the characteristics that people in the church begin to exhibit. The main thought of these verses is depicted in the opening and concluding phrases while everything else sandwiched in between amplifies this central thought. Thus, the central thrust of these verses is that men will become lovers of self (3:2a) rather than lovers of God (3:4b). Everything else in between these phrases describes the characteristics of people when they reach this state (3:2b-4a). Therefore, Paul predicts that when men become lovers of self rather than God they will exhibit the following characteristics: love of money, boastfulness, arrogance, blasphemy, disobedience to parents, unthankfulness, lovelessness, unholiness, unforgiveness, slanderous, lacking self-control, brutality, haters of good, treacherous, reckless, conceited, and pleasure lovers. While many interpreters mistakenly apply these verses to the outside world, the world has always been this way. If the world has always exhibited these qualities, how could the world manifesting these qualities constitute a sign? Rather, 2 Timothy is a pastoral letter. Timothy, the immediate recipient of the letter, was a pastor over the church at Ephesus. Therefore, Paul is describing what people within the church will become like once the spirit of the world invades the church. It is in this context of the spirit of the world controlling the church that Paul warns, "But know this, in the last days perilous times will come" (2 Tim. 3:1, italics added). We might ask, "perilous for whom?" Since 2 Timothy is a pastoral letter, we can safely conclude that the peril or danger that Paul predicts will arrive will be the adversity experienced by Timothy as well as all other faithful pastors. Why will Timothy and others experience peril once the spirit of the world invades the church? The man of God will experience difficulty in such a setting because he will be attempting to declare God's truth before people who are not interested in listening to it but are rather more interested in having their ears tickled. Thus, pastoral work will become difficult, as the pastor will find himself battling with his own congregation. This fact explains why Pauline warnings of apostasy are accompanied by warnings of difficulty for the pastor. For example, reference has already been made to Paul's prediction that "evil men and imposters" will grow "worse and worse" (2 Tim. 3:13). However, the preceding verse says, "Yes, and all who desire to live a Godly life in Christ Jesus will suffer persecution" (2 Tim. 3:12, italics added). Similarly, reference has already been made to Paul's warning that the church will no longer support a platform for the teaching of sound doctrine (2 Tim. 4:3-4). Interestingly, the subsequent verse says, "but you be watchful in all things, endure afflictions…" (2 Tim. 4:5, italics added). Paul warns Timothy of these coming dangers since Timothy is the one who must bear up under them as a spiritual leader attempting to be faithful to God in the midst of a church that is gradually moving away from truth. In sum, as described in this article, not only does apostasy introduce spiritual danger but it also brings adversity into the life of the faithful spiritual leader. William R. Newell, The Book of the Revelation (Chicago: Moody, 1935), 75. See also Robert L. Thomas, Revelation 1–7: An Exegetical Commentary , ed. Kenneth Barker (Chicago: Moody, 1992), 296.